Xuedong Huang (黄学东) is a Microsoft Technical Fellow in Cloud and AI. He leads Microsoft’s Speech and Language Group. In 1993, Huang joined Microsoft to found the company’s speech technology group. As the general manager of Microsoft’s spoken language efforts, he helped to bring speech to the mass market by introducing SAPI to Windows in 1995 and Speech Server to the enterprise since 2004. He served as General Manager for MSR Incubation and Chief Architect for Bing and Ads. In 2015, he returned to AI and Research to lead the advanced technology group. He led the team achieving a historical conversational speech recognition human parity milestone on the Switchboard task and another historical human parity milestone of machine translation on the WMT-2017 task. 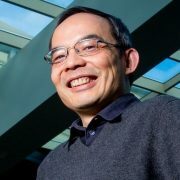 He was on the faculty of School of Computer Sciences at Carnegie Mellon University before joining Microsoft. He received Alan Newell research excellence leadership medal in 1992 and IEEE Best Paper Award in 1993. He was named the Asian American Engineer of the Year (2011), Wired Magazine’s 25 Geniuses (2016), and AI World’s Top 10 (2017). He holds over 100 patents and published over 100 papers & 2 books. He received his PhD, MS, and BS in Computer Science from the University of Edinburgh, Tsinghua University, and Hunan University respectively. He has been elected fellow of IEEE and ACM.